Do you love to take photos and video with the camera on your phone? Many of us rarely use anything else for photography these days. 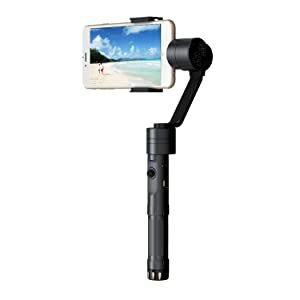 It’s only natural that you can now buy a handheld gimbal stabilizer for your smartphone and not just your DSLR. Why use a stabilizer for video you take with your phone? Anyone who’s used a Steadicam or a Glidecam with a regular camera can tell you that it makes all the difference. A stabilizer takes the shake out of your video. With a gimbal, you can pan, tilt, and zoom and your film looks smooth and professional. You can shoot action scenes without the jerkiness you would normally see when you’re walking or running with a camera. With that said, let’s review four of the best smartphone stabilizers. We’ll start with two popular models from Zhiyun, then check out one from Lightwish, and wrap up with one from DJI. Zhiyun’s Smooth-II Handheld Gimbal Camera Mount works on both Android and Apple iPhones. In fact, it works on most phones with screens up to 7-inches in size and between 2.2 and 3.2 inches in width. That list includes best-sellers like the iPhone 5s, 6 Plus, and 7 as well as the Samsung S3, S4, S5, S6 and Note 3 and Note 4. The Smooth 2 is made from aviation-grade aluminum alloy so it’s lightweight, resistant to rusting, and durable. The grip surface is textured so it’s comfortable to hold in your hand. Without the battery or your phone, it weighs less than 14 ounces. That’s impressive when you consider the gimbal motors and electronics packed inside. At the bottom of the grip, you’ll see a ¼-inch screw thread. That’s because the Smooth-II is made to be used with other accessories like a tripod if you like. To use the Smooth-II, all you need to do is turn it on once you’ve secured your phone on it. Then use the joystick in the handle to select a mode. Double-pressing and single-pressing the 5-way joystick switches from Pan Following to Pan and Tilt Following to Locking Mode. Pan mode rotates the phone left and right in a full 360-degree circle. Use the joystick to adjust the tilt angle. Pan and tilt mode lets you phone tilt freely up and down, side to side. The roll axis is locked, but you can use the joystick to adjust it. Locking mode keeps the phone in place so it moves with the stabilizer just as if it were on a tripod. You can use the joystick to adjust pan and tilt angles. If you have the Zhiyun app on your smartphone, you can control the Smooth-II wirelessly with Bluetooth. This is handy if you have it mounted on a tripod. Watch this video review of the Zhiyun Smooth-II to see this smartphone stabilizer in action. The stabilizer comes with a rechargeable battery that lasts about 5 hours. You can charge your phone with it, a fact that is very handy indeed. Zhiyun says they built-in protection against circuit discharge to protect the gimbal if the motors are working too hard. If you prefer to use a Bluetooth remote control, Zhiyun sells one separately. But if you use the app on your phone, it lets you manage several functions like setting focus, switching between front and back cameras, and changing between taking photos and videos. Zhiyun offers a 1-year warranty on the Smooth-II. The Zhiyun Z1-Smooth-C also fits smartphones with large screens up to 7-inches in size. They include a counterweight for balancing heavy phones. The Z1-Smooth-C is the forerunner to the Smooth-II. It’s been discontinued but you can still buy it and get a good deal on it. Although many owners have said they love the Smooth-C, many of them comment on the fact that the initial setup with firmware upgrade and calibration can be confusing for inexperienced users. Zhiyun (at the time of writing) still has software downloads and instructions for the Z1-Smooth-C on their website. 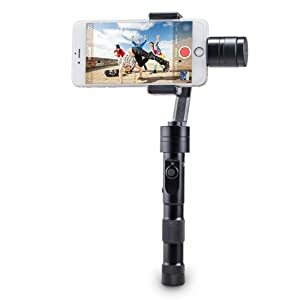 The Lightwish JJ-1 2-Axis Smartphone Stabilizer fits iPhone 5 and up as well as Android models made by Samsung as long as your screen isn’t larger than 6.8-inches. Similar to the Zhiyun Smooth-II, you can control the gimbal wirelessly with Bluetooth. But be aware that this stabilizer is only 2-axis. You can adjust it for tilt and roll but not pan. Lightwish recommends balancing your camera before you turn on the JJ-1. Roll angle gives you up to 300 degrees of movement and pitch up to 330-degrees for following the action when you’re filming. The gimbal makes your video zoom-ins look like the camera floated smoothly toward the target. Locking the stabilizer lets you use it like a monopod for still shots. The Lightwish stabilizer is a little lighter than the Smooth-II. It runs off a rechargeable battery and comes with a charger and micro USB cable as well as a user manual. 360-degree Panoramas made super-easy—hold up the OSMO M with your camera onboard and press the shutter button. The OSMO M keeps your camera level and rotates to take 9 photos. The app blends them together into one perfect panorama. 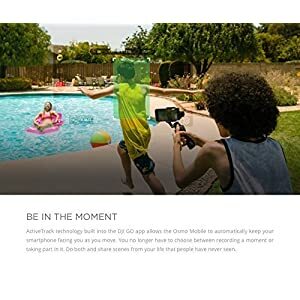 Because of the Bluetooth connection the OSMO M has with your smartphone, you can control your camera with it. Just install the app, pair the two devices, and get started. You can customize the joystick’s sensitivity, set push mode so you can adjust the gimbal by pushing on your phone, or invert the controls for pan and tilt. The OSMO Mobile app gives your phone’s camera advanced features like manual ISO and white balance settings. Want to see it in action? See this brief video. The DJI OSMO M stabilizer comes with a wrist strap, rechargeable battery, protective cover, charger and cable, plus a carrying pouch and cleaning cloth. You can use other small lenses with your camera and the OSMO M as long as they don’t affect the balance. At 7.09 ounces with the battery, it’s the lightest of these four stabilizers. Now that you’ve had a look at the best smartphone camera stabilizing gimbals, let’s go over the pros and cons of each one. We’re excited that handheld stabilizers are now available for smartphone cameras. If you’ve used one before for your regular camera, you can adjust quickly to using a gimbal for your cell phone. If you’re serious about using your phone for photography and videos, we recommend either the Zhiyun Smooth-II or the DJI OSMO M. They have the most features. The OSMO M is especially nice because it’s very customizable. If you’re just beginning to try filming with a stabilizer, you may find that the Lightwish JJ-1 is easy to use since you only need to think about pitch and roll. The Zhiyun Z1 Smooth-C may save you some money, but it has a reputation for being a bit challenging to upgrade and calibrate. Come back again to see more reviews of gadgets that make your life easier and much more fun. Overall the system is great and will become even better when you learn how to use it. 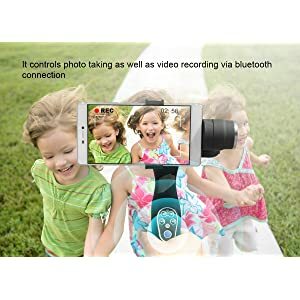 Current price is quite high but the product itself is really one of the best on today s market, getting you smooth buttery footage which is great for vlogging or short films. Good to know!﻿ Thank you , Johan ! There are many groups of people in China monitor Kickstarter and Indiegogo 24/7 to see if there is anything worth to copy. As soon as they see something they will copy it and ship the product before these crowdfunder does or sometimes even before the fundraising finished. It is not a secret and those Chinese are very good at it. So there is no surprise when you see similar or an exact product selling on eBay or Amazon before you know it, with a lot cheaper price tag. Is there a specific vendor I should look for? Maybe a search phrase? If you could provide a link that would be greatly appreciated. Thank you! This is great! Now when you fall off a cliff or get hit by a car because you’re too distracted by yourself, I’ll have a really well-captured video to watch. It is common knowledge that the best stabiliser device in the world is the head of the hen. Dear smove, you arrived late! we could be working on a cure or something but nooooooo we want to stop our hand from shaking when were taking a goddamn photo of a cat. yeah, let those engineers and software developers work on a cure, brilliant idea! I wonder much these are? Just for when I have to replace one after throwing it under a bus because somebody was taking selfies in a busy doorway. Receive the coolest tech, gadgets, lifestyle and future products straight to your inbox. Gigadgetstech.com is a participant in the Amazon Services LLC Associates Program, an affiliate advertising program designed to provide a means for sites to earn advertising fees by advertising and linking to amazon.com, amazon.co.uk, amazon.ca, endless.com, smallparts.com, myhabit.com, and any other website that may be affiliated with Amazon Service LLC Associates Program.